Description: This is Florida's largest bat. Its fur ranges in color from dark gray to brownish-gray. As with other bats in the family Molossidae its tail extends well beyond a short tail membrane. 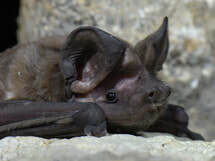 It has large broad ears that slant forward over the eyes from which it gets the common name of "bonneted bat." Florida roosting preferences: Colonial. Roosts in cliff crevices, tree cavities and buildings. In 2003 a small colony was found roosting in a bat house in Fort Myers. Food preferences: Insectivorous. Known to feed on beetles, flies and true bugs. Reproduction: Females give birth to a single pup, but may have more than one reproductive cycle per year. Pups are born during the summer from June through September. Florida status: Rare. Classified as Endangered by the Florida Fish and Wildlife Conservation Commission. Note: Previously known as Wagner's mastiff bat (Eumops glaucinus floridanus) but was reclassified in 2004 as a separate species unique to Florida.